We’re blessed to share that we can assist adoptive parents with their home studies even if they live abroad. Often times, this includes military families or missionaries. We are licensed and authorized to provide Home Studies for US Citizens Abroad in any foreign country. We have experience in providing these services already. We have helped families who are temporarily residing in England, Oman, Turkey and Germany. Providing home studies for US Citizens abroad is a process that is quite a bit tougher to accomplish. The legal requirements are different and more difficult to prepare. However, we do not charge anything different than what we charge to do a home study if you simply lived stateside. The only additional expense would be the direct expense associated with sending one of our agency’s social workers to wherever you are. To learn more about how we can help you with your home study if you reside outside the United States, please contact us below. We could also set up a Skype appointment. 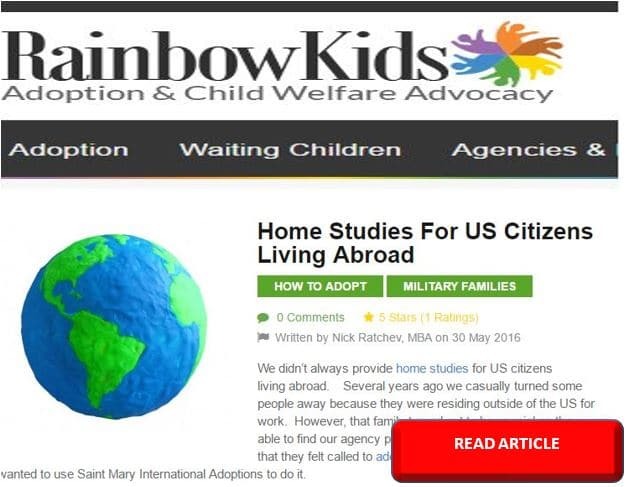 An article about home studies for US Citizens residing abroad written by our agency’s Operations Manager, Nick has been posted on Rainbowkids.com and you can read it here.